A week ago Friday, I received a phone call from my father. He was on his way to my grandmother’s house because she fell down over another person’s wheelchair. 911 had to be called because she could not get up and was in a great deal of pain. After many tests, they were able to rule out several things. After a CAT scan, they found a double pelvic fracture. Mimi was in the hospital until mid last week. At that point, she was doing well enough to be transferred to a facility for rehab. She actually ended up going to the same home that my grandfather had been in for many years. On Friday, the boys and I went to the home to see Mimi. When we arrived in her room, JSL clammed up. He stopped talking, would not look at people and was shaking. He had never been there before. NHL had actually been in the same room with Poppy S, but he was so little he would not remember it. We stayed for a short time and then left to let Mimi rest. The next day, it was beautiful and we met Mimi outside for some air. Once again, we noted that JSL did the same thing. 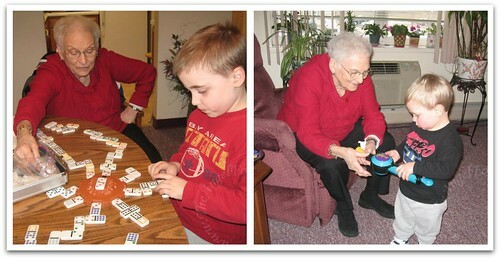 When he was near the wheelchair and Mimi, he was skittish at best. When he walked with Aunt S to her car for something, he perked up. Then, as he came closer to us, he stopped again. We talked with him about how Mimi was there to help her get better. In two year old terms, we told him that Mimi fell down and had a boo-boo that needed to get better by staying there. NHL had done something similar with Poppy S when he was in his wheelchair when NHL was about this age. When we decided to go back to visit Sunday afternoon, we took a bag of tricks with us. We figured if JSL had some toys, he may be more comfortable. 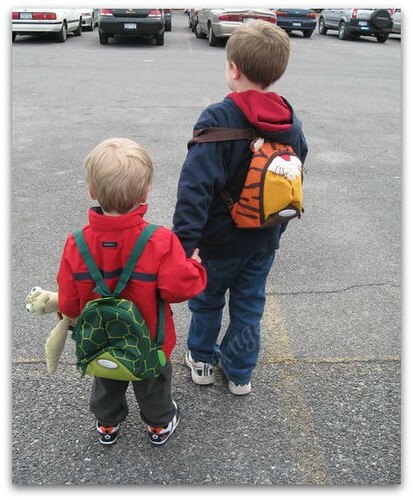 Here are both of the kids wearing their animal backpacks in to visit Mimi. Then, it was time to say goodbye to Mimi and do some Passover shopping. Here’s to wishing Mimi a speedy recovery. The boys are looking forward to playing at her apartment when she goes back home. « Spring 2010 is here! Yup it is a must to bring toys and books to visit Great grandpa, even a ball she has played catch with him from his wheelchair!